Radiant of the Eta Aquarid Meteor Shower peaking before dawn on May 6th. Grab a blanket or a comfy lounge chair to sit back, relax and watch the Eta Aquarids meteor shower, one of two annual showers caused by dust particles from Halley's Comet. Catch the peak of the dazzling show before dawn on May 6. The waning gibbous Moon might outshine some of fainter meteors, but there will still be opportunities see meteors streak across the night sky at the approximate peak rate of about 30 per hour. 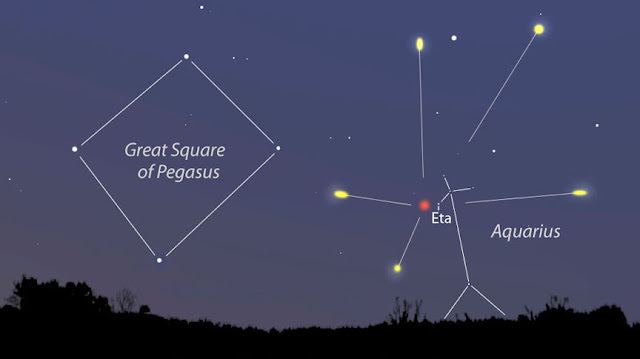 Look for meteors appearing to radiate from the constellation Aquarius. Jupiter reaches opposition on May 9th, making it the best night of the year to explore the gas giant planet and its four brightest moons Io, Europa, Ganymede, and Callisto. Since Jupiter will be directly opposite the Sun from Earth, it will be visible all night long. Opposition occurs when a planet reaches its closest approach to Earth in its elliptical orbit. Take advantage of Jupiter's brightest night of the year and take a closer look at its cloud band "stripes" and four Galilean moons with any size telescope. 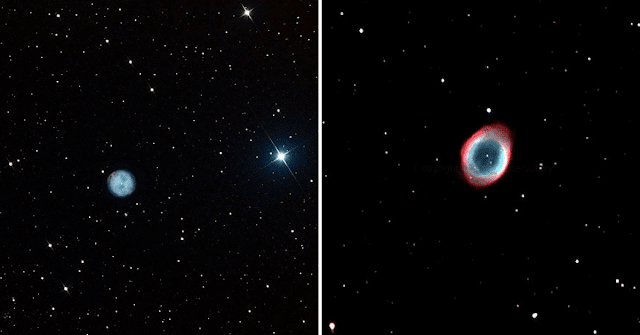 M97, the "Owl Nebula" in Ursa Major (left) and M57, the "Ring Nebula" in Lyra (right). Use a 6" or larger telescope and an Oxygen-III or UltraBlock filter to catch nice views of four relatively large planetary nebulae in May skies. See the "Ghost of Jupiter," NGC 3242 in Hydra; M97, "the Owl Nebula" in the Big Dipper; NGC 4361 in Corvus, and the famous "Ring Nebula", M57 in Lyra just a few degrees from bright star Vega. To help you locate these objects, use the The DeepMap 600. Take advantage of the dark skies provided by the New Moon on May 15th to scope out the many star clusters, galaxies and other deep-sky gems on display. Pack up your astronomy gear using our full line of telescope and accessory cases and head to a dark sky site for the best viewing conditions. M13, the "Great Globular Cluster in Hercules (left) and M3, Globular Cluster i n Canes Venatici (right). Five picture-perfect examples of globular star clusters will be visible in May skies. Check out M3 in the constellation Boötes. 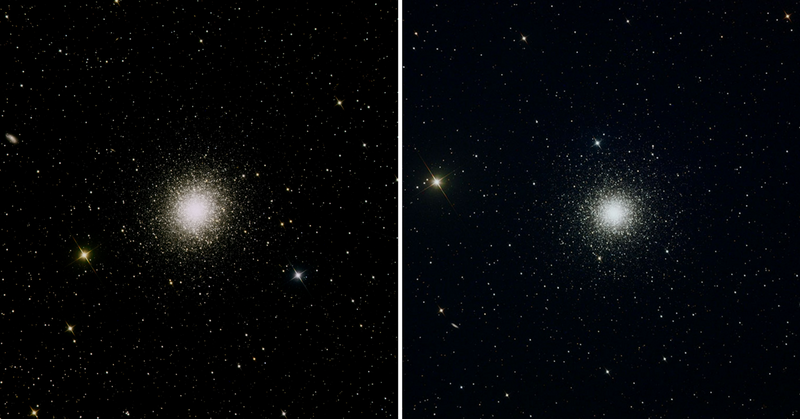 M13, the "Great Cluster in Hercules" will be visible near the zenith. M5 can be found in Serpens, and M92 in the northern section of Hercules. Be sure to track down M4 (NGC 6121) in Scorpius on May 27th, as it will be in a great position for telescopic study throughout the night, reaching zenith around midnight. 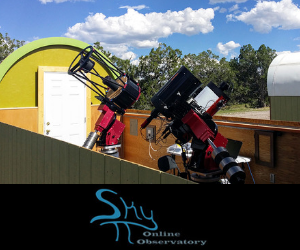 Big telescopes will provide the best views, but even a pair of humble 50mm or larger binoculars will show you these dense balls of stars from a dark sky site. After the sun sets on May 17th, you'll find a stunning view of the waxing crescent moon to the left of brilliant Venus. While you're observing the pair, use at telescope to look for the crater Furnerius at the lower right of the crescent moon's face. 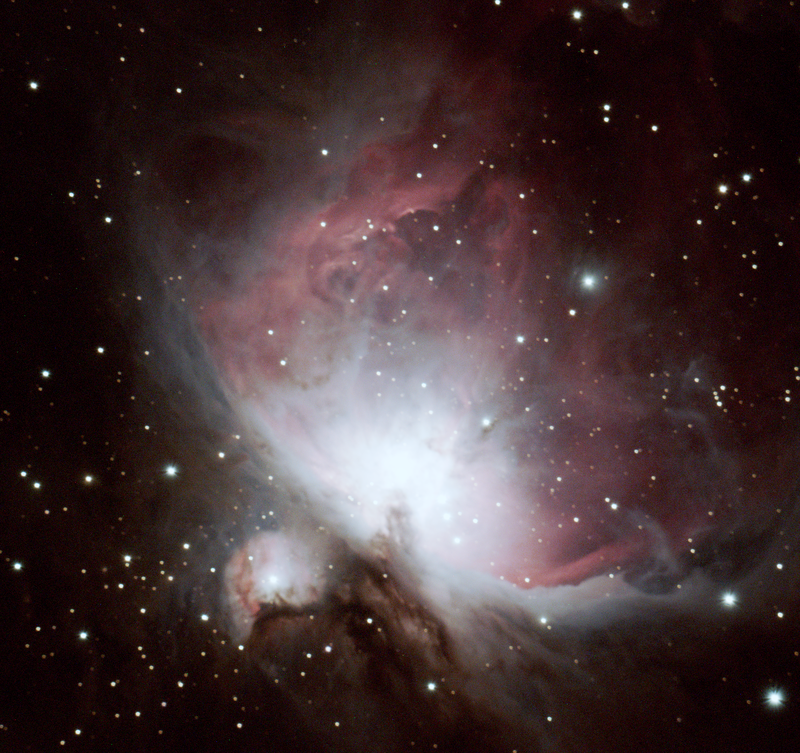 Try Orion's 1.25" Orion 25% Transmission Moon Filter, perfect for crescent phases, to improve lunar contrast and tone down glare. 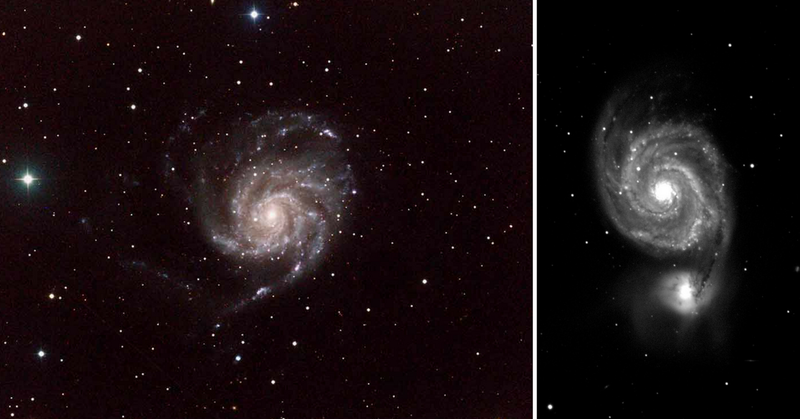 M101, Face-On Spiral Galaxy in Ursa Major (left) and M51, Face-On Spiral Galaxy in Canes Venatici (right). Use a large telescope to see the classic pinwheel shapes of galaxies M51 and M101 in the Big Dipper asterism of Ursa Major, and M99 and M100 in the Virgo galaxy cluster. There are also dozens of additional galaxies to explore in the Virgo cluster with a large aperture telescope. All objects described above can easily be seen with the suggested equipment from a dark sky site, a viewing location some distance away from city lights where light pollution and when bright moonlight does not overpower the stars.